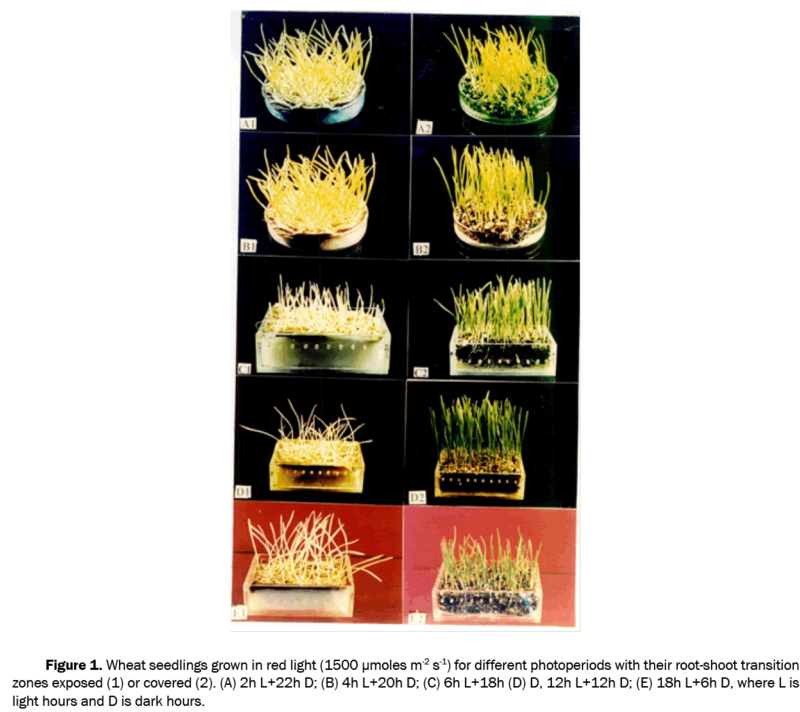 Wheat seedlings were grown in red light (1500 μmol m-2 s-1) for different photoperiods having their root shoot transition zones exposed or covered from red light. Seedlings grown under 2h L, accumulated similar amount of chlorophyll and carotenoids in both the conditions. However, the amount of chlorophyll, carotenoid and protochlorophyllide decreased with increase in photoperiod and increased with increase in photoperiod respectively in seedlings having root shoot transition zones exposed and covered respectively. Low temperature 77k spectra of leaves excised just before the end of dark period from plants showed that a blue shift was observed in the photo-transformable Pchlide with F655 shifting to F653 from 2h to 6h L in seedlings grown with their root-shoot transition zone exposed. This shows the presence of prolamellar bodies in these seedlings. However, in 2hL, photosystem II (PSII) and photosystem I (PSI) were absent in seedlings with their root-shoot transition zones exposed whereas PS I was absent in the seedlings with their root-shoot transition zone covered. Well defined PSI and II were observed in 4hL and 6hL photoperiod in these seedlings. Results demonstrate that a threshold of red light is required for manifestation of present inhibition of greening process and subsequent dark period does not restore the greening process. Synthesis of PORA and subsequent assembly of Pchlide-PORA is also affected as demonstrated by increase in ratio of relative fluoresence of Pchlide to Chlide and by blue shift in the photo transformable Pchlide forms. Light is energy source as well as an important signal for plant growth and development . Light quality and quantity effect chlorophyll and carotenoid content and photosynthetic characteristics eventually effecting overall plant growth and development. Plants tend to adapt the structure of photosynthetic apparatus, pigment composition and their phototropic and photomorphogenic responses to different light qualities and quantities . There are substantial differences in spectral distribution of light in various plant habitats with high light intensities in tropical regions to very low light intensities under water. The growth and development of plants also occur during dark and is known as skotomorphogenesis. During skotomorphogenesis protochlorophyllide accumulates as the major pigment. The conversion of protochlorophyllide to chlorophyllide and then to chlorophyll requires light demonstrating spectral dependence of chlorophyll biosynthesis in plants [3-5]. Böddi et al. have shown the presence of four universal forms of protochlorophyll (ide) from different plant species: at 633 nm, at 645 nm, at 657 nm and one at 670 nm with their vibration sublevels at 693 nm, 710 nm, 726 nm and 740 nm respectively. Using photo periodically grown plants, Schoefs and Bertrand , have shown that peak of photo transformable Pchlide is at 653 nm (associated with pro-thylakoid membranes), instead of 656 nm (associated with prolamellar bodies). These photo ransformable Pchlide changes to chlorophyllide (Chlide) in response to saturating light flashes. This conversion involves synthesis of various intermediates. The peak of photo transformable Protochlorophyllide at F653 nm or 656 nm decreases on flash illumination and a peak due to Chlide: POR:NADP+ appears at 690 nm, which within a fraction of second shifts to 694 nm due to Chlide:POR:NADPH. After incubation for 5 s in dark a peak at 676 nm due to free Chlide was observed in bean . Many non-fluorescent and fluorescent intermediates of Pchlide are formed during this conversion [4,9]. Franck et al. have shown that in etioplast membranes of dark-grown wheat Pchlide associated with NADP+ and NADPH gives peak was at 681 and 690 nm respectively after flash illumination and subsequent dark incubation. Photoactive Pchlides are regenerated by different pathways: 1) After the photoreduction through the formation of a non-photoactive Pchlide form emitting fluorescence at approximately 651 nm (Pchlide-POR-NADP+), 2) After dislocation of large aggregates of Chlide-light-dependent POR-NADPH ternary complexes . Le lay et al. have shown that in etiolated barley leaves, a saturating flash of 200 ms (0.2 sec) induces photo transformation of protochlorophyllide F655 to chlorophyllide, than into chlorophyll, which do not require light. Earlier studies on wheat seedlings grown under continuous red light (500 μmol m-2 s-1) have shown that the seedlings were not green and did not accumulate any chlorophyll when their root-shoot transition zones were exposed to red light. Chlorophyll synthesis and development of photosystems was inhibited in these seedlings [12-14]. On the other hand seedlings with their root shoot transition zone covered from red light were green and accumulated chlorophyll [12-17]. The above inhibition of greening process was completely reverted by blue light (50 μmol m-2 s-1) and partially reverted by far-red light (200 μmol m-2 s-1) . The photoreceptors play a critical role in greening process in plants. These photoreceptors alone or in combination affect the overall growth and development in plants. Phytochromes and cryptochromes mediate red-light and blue-light mediated responses respectively . The signaling functions of photoreceptors are activated or inhibited by light facilitating information flow in either condition . In higher plants three forms of phytochromes Phy A, Phy B and Phy C are found in monocots like rice and five forms (Phy A to E) are found in dicots like Arabidopsis . Phy A in contrast to other family members accumulates in large amount in etiolated plants . Studies done by Roy et al. have shown persistence of PhyA especially in the shoot-bottom in rice seedlings grown in red light (400 μmol m-2 s-1) with their root-shoot transition zones exposed suggesting its probable role in inhibition of greening process. In the earlier studies [13,14] the seedlings were grown under continuous illumination of red light (500 μmol m-2 s-1). These seedlings manifested inhibition of greening process when their root-shoot transition zones were exposed to red light. Therefore, in order to understand whether continuous illumination is prerequisite for manifestation of this response or some threshold level of red light for shorter duration may lead to inhibition of greening process, present study was undertaken. Besides this the accumulation of protochlorophyllide and its conversion to chlorophyllide was also studied to understand effect of photoperiodic illumination of red light (1500 μmol m-2 s-1) on accumulation of chlorophyll and formation of Pchlide-POR complexes and their photo-transformation by saturating flash of red light (0.2 sec) on wheat seedlings grown with their root-shoot transition zones exposed and covered from red light in vivo. Wheat (Triticum aestivum cv HD 2329) seeds were used as experimental materials. The seeds were obtained from Indian Agricultural Research Institute, New Delhi. Porphyrins were purchased from, Logan UT. All the chemicals and solvents were of analytical grade. Hepes buffer, ethylene diamine tetracetic acid (EDTA), sorbitol, 5-bromo-4-chloro-3-indol phosphate (BCIP), nitroblue tetrazolium (NBT), Alkaline phosphatase (AP), acrylamide, bis-acrylamide were purchased from Sigma Aldrich, USA. Light source for plant growth in red light was Gallium-aluminium-arsenide light emitting diodes (LEDs) having high output in red region of photosynthetic absorption with maximum spectral output at peak wavelength of 670 nm and narrow bandwidth of 26 nm. This peak wavelength corresponds to the peak of photosynthetic action spectrum of plants. Wheat (Triticum aestivum cv HD 2329) seeds were germinated and grown in a dark room on water in Petri dishes or acrylic trays in red light (1500 μmol m-2 s-1) LEDs on germination paper having their roots and root-shoot transition zones exposed (V-) or in vermiculite (V+) having their roots and root-shoot transition zones shielded from red light in different photoperiods of 2h L+22h D, 4h L+20h D, 6h L+18h D, 12h L+12h D, 18h L+6h D, 24h L, for 5 days. Here ‘L’ is light period, ‘D’ is dark period and ‘h’ stands for hours of light treatment. There was no increase in temperature in the plant growth area and same moisture content was maintained in both growth conditions. All the measurements were done just before the end of dark period. Three replicates of 100 mg leaves were taken from 5-d-old seedlings. Leaves were cut into pieces and hand homogenized in pre-chilled mortar and pestle in 10 ml of ice cold 80% acetone at 4°C under green safe light. Homogenate was passed through 8 layers of cheesecloth and centrifuged in sorvall centrifuge with SS-34 rotor at 10,000 rpm for 10 min. Supernatant was taken. Chlorophyll and carotenoids contents were measured spectrophotometrically as described by Porra et al. and Welburn and Lichenthaler  respectively on UV-160A (Shimadzu Corporation, Kyoto, Japan) double-beam spectrophotometer. Absorbance was taken at 663 nm, 645 nm and 470 nm. Reference cuvette contained 80% acetone. Leaves from 5-d-old seedlings grown under different light regimes were taken and total tetrapyrroles synthesis was monitored before dark incubation. Three replicates of 100 mg leaves were taken and homogenized in 10 ml of 90% ammonical acetone. For preparing 90% ammonical acetone, 1 N ammonia solution (7.48 ml in 100 ml distilled water) was prepared and then diluted ten times. This 0.1 N ammonia solution was taken and acetone was added so as to obtain 90% acetone in 0.1 N ammonia. The homogenate was centrifuged in sorvall centrifuge in SS-34 rotor at 10,000 rpm for 10 min at 4°C. Supernatant was taken and HEAR (Hexane extracted acetone residue) was prepared. For preparing HEAR, acetone extract of sample was taken in a separating funnel and equal volume of ice cold hexane was added to it. This was mixed properly and the two layers were allowed to separate. Lower layer was taken. To this layer 1/3rd volume of hexane was added. Again the two layers were mixed and allowed to separate. Lower layer was taken. This layer was hexane-extracted acetone-residue mixture (HEAR). Emission spectra E440 nm was recorded from 580 nm to 700 nm. Pchlide content was calculated as described in Hukmani and Tripathy . Leaves from 5-d-old plants grown under different photoperiodic regimes were excised just before the end of dark period immediately frozen in liquid nitrogen. Low temperature emission spectra (600 nm-770 nm at 440 nm excitation (E440) with slit width set to 2 nmwere recorded from leaves:- (i) just before the end of dark period, (ii) after illumination with saturating flash of red light (0.2 sec) and (iii) after incubation for 10 minutes in dark after flash illumination after freezing in liquid N2 by putting the leaves in Dewar cuvette containing liquid N2. This Dewar cuvette was then put in the cuvette holder. The fluorescence spectra were recorded in ratio mode in SLM-8000 (SLM Instruments, Inc. Urbana IL, USA) spectrofluoremeter having a photon counting device. The instrument was interfaced with an IBM microcomputer. Rhodamine B was used in the reference channel as a quantum counter. A tetraphenylbutadiene (TPD) block was used to adjust the voltage in both samples as well as reference channel to 20,000 counts per second at excitation and emission wavelengths of 348 nm and 422 nm, respectively. The excitation and emission bandwidths were adjusted to 2 nm. The photon count was integrated for 1 sec. Seedlings grown under continuous red light (1500 μmol m-2 s-1) for 24h having their root-shoot transition zones covered in vermiculite were completely green and accumulated normal amounts of Chlorophyll (Chl). However, under identical conditions, seedlings grown having their root-shoot transition zones exposed to red light (1500 μmol m-2 s-1) were not green (Figure 1) and did not accumulate Chl (Figure 2A). Wheat seedlings having their root-shoot transition zones covered were greenish yellow whereas those with root-shoot transition zone exposed were yellowish green (Figure 1, E2 and D2) when grown under grown under 2h light (L)+22h dark (D). However, these seedlings accumulated small but similar amounts of Chl (Figure 2A). Seedlings grown under 4h L+20h D photoperiodic regimes started behaving differently in relation to amount of Chl accumulated. Seedlings having their rootshoot transition zones covered from red light accumulated almost double amount of Chl as compared to 2h L+22h D seedlings having their root-shoot transition zones covered. However, seedlings grown under 4h L+20h D (Figure 2A) regime having their root-shoot transition zones exposed to red light accumulated very small amount of Chl, i.e., nearly 1/8th of 2h L+22h D seedlings. With further increase in photoperiod i.e., 6h L+18h D, 12h L+12h D and 18h L and 6h D, the seedlings having their root-shoot transition zones shielded from red light, i.e., grown in vermiculite, turned greener and there was a linear increase in Chl content (Figure 2A). However, seedlings grown under identical conditions having their root-shoot transition zones exposed to red light were not green and did not accumulated Chl (Figure 2A). This demonstrated that even 4h light exposure of red light (1500 μmol m-2 s-1) was sufficient to induce present photomorphogenic response. This response could not be reversed in the succeeding 20h dark period leading to conclusion that a critical dose of 2,16,00,000 μmol m-2 of light was sufficient to induce the non-greening photomorphogenic response in seedlings with their root-shoot transition zone exposed. Many studies have shown effect of light on chlorophyll biosynthesis and degradation in plants [12-14]. Figure 1: Wheat seedlings grown in red light (1500 μmoles m-2 s-1) for different photoperiods with their root-shoot transition zones exposed (1) or covered (2). (A) 2h L+22h D; (B) 4h L+20h D; (C) 6h L+18h (D) D, 12h L+12h D; (E) 18h L+6h D, where L is light hours and D is dark hours. Figure 2: Chlorophyll, carotenoid and protochlorophyllide content in plants grown in red light (1500 μmoles m-2 s-1) under different photoperiods. Seedlings grown under 2h L+22h D photoperiod having their root-shoot transition zones exposed or covered accumulated similar but small amount of carotenoids (Figure 2B). 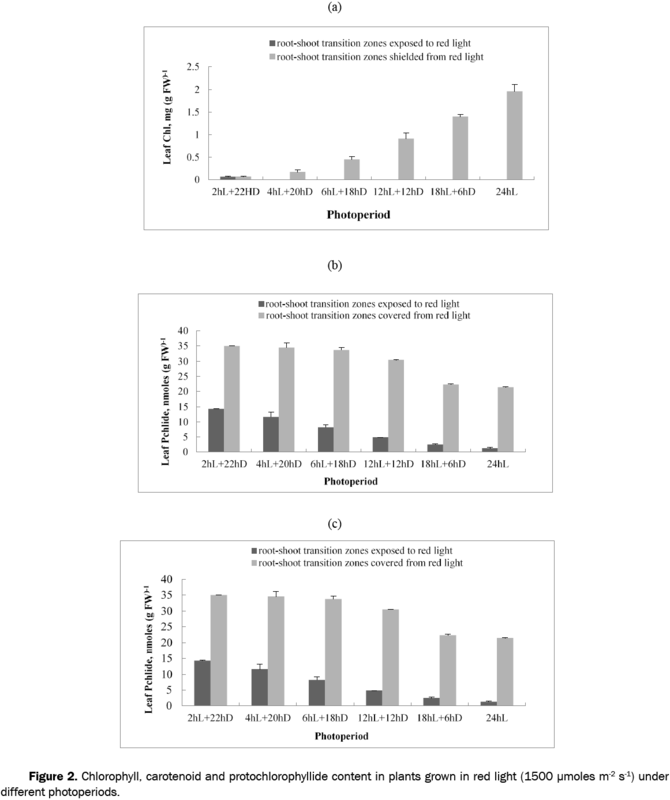 The carotenoid content of seedlings having their root-shoot transition zones shielded from red light linearly increased with increase in red light photoperiod from 4h L+20h D, 6h L+18h D, 12h L+12h D and 18h L+6h D (Figure 2B). The carotenoid content declined in seedlings grown having their root-shoot transition zones exposed, with increase in red light photoperiod (Figure 2B). However, in Arabidopsis seedlings grown under high light of 1800 μmol m-2 s-1 in photoperiod of 8h L+16h D, the carotenoid content increased with increase in light intensity . Carotenoids usually act as a scavenger for singlet oxygen generated in pigment bed in response to light treatment . As substantial amount of carotenoids were present in seedlings grown under 4h L+20h D photoperiod, the non-accumulation of Chl in these plants may not be due to the oxidative destruction of already synthesized chlorophyll. Seedlings grown under different photoperiods having their root-shoot transition zones covered from red light accumulated small amounts of protochlorophyllide (Pchlide) when measured before the end of dark period. However, plants grown under similar conditions with root-shoot transition zones exposed to red light accumulated substantially low amounts of Pchlide (Figure 2C). Proto chlorphyllide accumulates as the major pigment in dark. On subsequent exposure to light it gets converted to chlorophyllide [3,4]. The accumulation of Pchlide was very less in seedlings with their root-shoot transition zones exposed to red light. The chlorophyll accumulation is very less in these plants. This suggests that either Pchlide synthesis or protochlorophyllide reductase expression or formation of Pchlide-POR complexes are inhibited in these seedlings. To further understand the functional status of Pchlide and POR and organization and assembly of PSII, PSI, low temperature fluorescence spectra (E440, excitation at 440 nm) from leaves, were recorded. Seedlings grown under continuous red light (500 μmol m-2 s-1) having their root-shoot transition zones exposed, synthesized low amount of Pchlide, most of which accumulated in non-photo-transformable form [13,14]. Therefore, plants grown under photoperiodic regimes having their root-shoot transition zones exposed or shielded from red light were studied to ascertain the functional status of Pchlide pool. 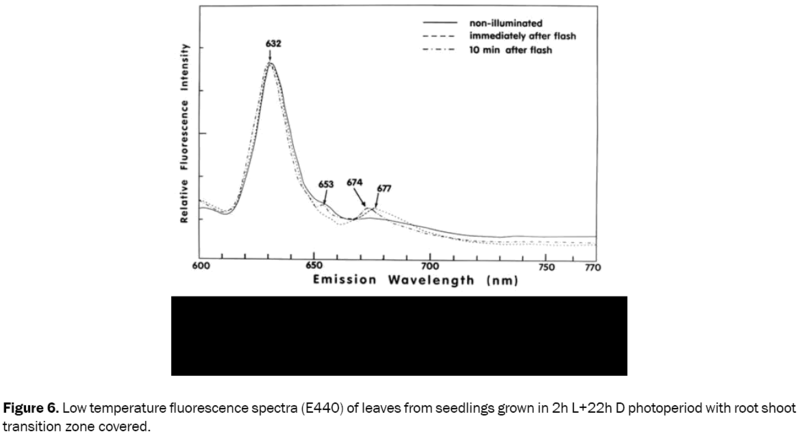 Leaves were excised from the seedlings having their root-shoot transition zones covered as well as exposed from red light just before the end of dark period and their fluorescence spectra at 77K were recorded (E440) as described in material and methods. As shown in Figures 3B and 4, leaves excised just before the end of dark period from plants grown under red light having root-shoot transition zones exposed in 2 hL+22 h D regimes, accumulated substantial amount of Pchlide in non-photo-transformable form (E440, F632 excitation at 440 nm with fluorescence at 632 nm). However, they also accumulated significant amount of Pchlide in photo-transformable form as shown by a fluorescence peak at 655 nm. A peak with fluorescence at 676 nm was also observed due to Chl(ide). Small peak at 655 nm could be attributed to less Pchlide amount, as a result small amount of complexes of Pchlide-POR-NADPH were formed . The 655 nm peak of Pchlide-POR-NADPH complexes are associated with prolamellar bodies . As long dark period was there in this photoperiodic regime, prolamellar bodies might have developed leading to peak at 655 nm. Although these seedlings were slightly green peak of PSII and PSI were not observed. Upon flash illumination, the peak at 655 nm due to photo-transformable Pchlide was substantially reduced and a broad peak having near maxima from 677-680 nm appeared due to transformation of Pchlide to Chlide showing presence of functional protochlorophyllide reductase (POR A) (Figure 4). After 10 min dark incubation the fluorescence peak at 676 nm was observed (Figure 4). This may be due to inhibition of synthesis/assembly of PSII proteins. In these seedlings the carotenoid content was more as compared to seedlings grown in larger photoperiods. Griffiths et al. have shown that illumination of wheat etioplast membranes with 60 W lamp for 30 sec lead to transformation of 635 nm and 652 nm peaks to a smaller peak at 632 nm and an intense peak at 680 nm. The 632 nm peak was due to non-photoactive pigment whereas 680 nm peak due to chlorophyllide. Yahuban et al. , have shown that the conversion of Pchlide to Chlide was inversely proportional to carotenoid content in wheat seedlings. Using dark grown wheat seedlings they have shown that in the leaves with reduced carotenoid content, a greater number of protochlorophyllide molecules transform to Chlide per light flash as compared to that in normal leaves. The ratio of Chlide /Pchlide (657) was always highest in leaves nearly deficient in carotenoids, medium in leaves with carotenoid deficiency and lowest in normal leaves . However, in the present study the ratio of relative intensity of Pchlide to Chlide increases with decrease in carotenoid contents of seedlings (Figures 2, 4, 5 and 6). This decrease can be attributed to lower amounts of POR A in these seedlings (results not shown). Figure 3: Low temperature fluorescence spectra (E440) of leaves from seedlings grown in 2h L+22h D photoperiod (A) Zone covered (B) Root shoot transition zone exposed. 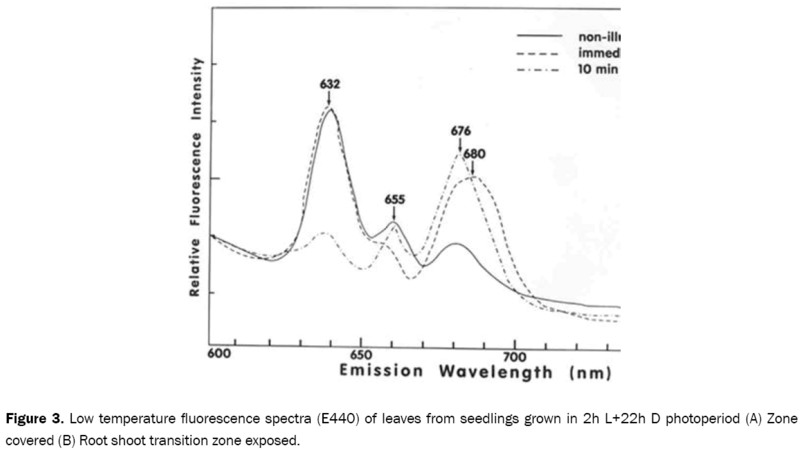 Figure 4: Low temperature fluorescence spectra (E440) of leaves from seedlings grown in 2h L+22h D photoperiod with root shoot transition zone exposed showing flash induced changes. Figure 5: Low temperature fluorescence spectra (E440) of leaves from seedlings grown in 6h L+18h D photoperiod with rootshoot transition zone exposed showing flash induced changes. Figure 6: Low temperature fluorescence spectra (E440) of leaves from seedlings grown in 2h L+22h D photoperiod with root shoot transition zone covered. In seedlings grown under red light (1500 μmol m-2 s-1) in photoperiodic regime (under 2h L+22h D regime) having their root-shoot transition zones covered in vermiculite a small peak at 632 nm and a smaller peak at 655 nm due to non-phototransformable and photo-transformable Pchlide respectively were exhibited (Figure 3A). The 655 peak could be due to oligomeric photoconvertible Pchlide. Using 77K fluorescence emission spectra in vitro studies in etiolated pea homogenates have shown conversion of aggregates of 636 nm emitting monomeric protochlorophyllide form into flash-photoactive oligomeric 644 and 655 nm emitting forms . These leaves also showed a huge peak at 685 nm, which could be attributed to PSII core complex (D1/D2/ cytb559 complex). Fluorescence peak due to 696 nm (due to CP43/CP47) and at 735 nm (due to PSI) were absent (Figure 3B). This could be due to inhibition of synthesis/assembly of PSI proteins. In seedlings grown under 4h L+20h D and 6h L+18h D photoperiodic regimes having their root-shoot transition zones exposed to red light peaks at 631 nm, 654 and 675 nm were of non-photo-transformable Pchlide, photo-transformable Pchlide and Chlide respectively were observed. After flash illumination the peak at 654 nm decreased substantially and a broad peak at 680 nm instead of P695, increased, due to photo-transformation of photo-transformable Pchlide to Chlide in seedlings grown in 4h L+20h D photoperiodic regime. However in 6h L+18h D photoperiod the Chlide peak was observed at 677 nm in seedlings with their root shoot transition zone exposed. Amirjani et al. , have shown that an energy transfer from short-wavelength Pchlide to long-wavelength Pchlide does not occur if many Pchlide molecules attach in Pchlide-POR complex. However, as Pchlide itself is less in the present study small complexes of POR-Chlide-NADPH were formed resulting in a peak at 680 nm instead of 695 nm after flash illumination. After 10 min dark incubation after flash, the peaks at 680 nm and 677 nm peaks of two different shifted to 675 nm (Figures 5 and 7) which was due to release of free Chlide from Chlide-POR-NADP+ complex. Peak at 655 nm reappeared with a decrease in 632 nm peak. This was due to formation of Pchlide-POR-NADPH complex at the expense of non-phototransformable Pchlide. 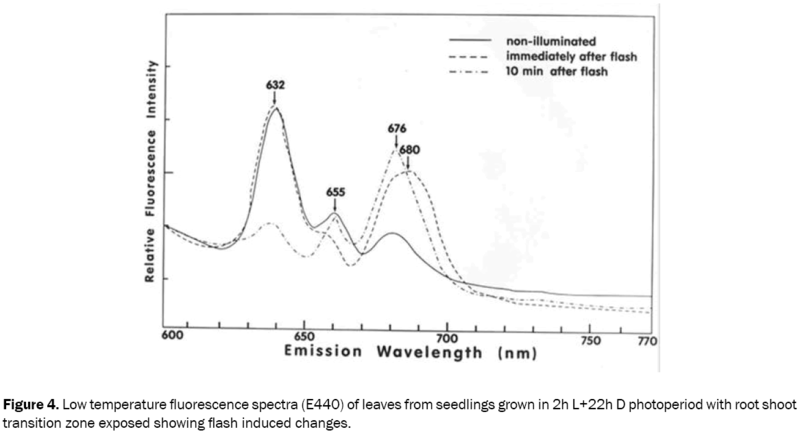 Figure 7: Low temperature fluorescence spectra (E440) of leaves from seedlings grown in 6h L+18h D photoperiod root-shoot transition zone exposed showing flash induced changes. With increasing photoperiod from 2h to 4h to 6h the fluorescence emission peak of photo-transformable Pchlide blue shifted from 655 nm in 2h to 654 nm in 4h and 653 nm in 6h photoperiod. Thus the blue shift of photo-transformable Pchlide from 657 nm in dark grown seedlings to 653 nm in 6h photo periodically grown seedlings demonstrated the light induced change in structural organization of Pchlide-POR complex. In fact green bean leaves grown under 16h L+8h D photoperiodic regimes had a peak at 653 nm due to photo-transformable Pchlide. Thus shorter wavelength form of Pchlide-POR-NADPH (655, 654 and 653 nm) may be preferentially associated with pro-thylakoid and thylakoid membranes . Fluorescence peaks at 687 nm and 693 nm due to PSII and a peak at 742 nm due to PSI (Figure 6) were observed in seedlings gown in both 4h L+20h D and 6h L and 18h D photoperiod regimes with their root shoot transition zone covered showing normal development of both the photosystems in these seedlings. As chlorophyll is present in sufficient amount it led to well developed, PSII and PSI. period required for manifestation of the non-greening photomorphogenic response which was earlier illustrated [12-14]. Chlorophyll accumulation and carotenoid levels decreases with increase in photoperiod in seedlings grown in red light with their root shoot transition zone exposed. Carotenoids act as scavengers of reactive oxygen species. These reactive oxygen species are formed on exposure of plants to different stress conditions like high light, exposure to herbicides etc, leading to degradation of chlorophyll. If chlorophyll degradation has occurred in seedlings with their root shoot transition zone exposed, there would be increase in reactive oxygen species leading to increased carotenoid content in these seedlings. Therefore, in the present study similar levels of carotenoids in the seedlings with their root shoot transition zone exposed (non-green leaves) or covered from red light (green leaves) states that chlorophyll degradation does not occur in these seedlings. Instead chlorophyll biosynthesis is inhibited at some point . The synthesis of Pchlide decreases with increase in photoperiod which is accompanied with decrease in POR A availability in plants grown with their root-shoot transition zones exposed. This decrease in POR A and Pchlide could not be restored in subsequent long dark periods. The structural organization of Pchlide-POR complexes also changes with increase in photoperiod. The presence of P654 and 653 forms of Pchlide in seedlings grown in 4h L+20h D and 6h L+18h D photoperiods with their rootshoot transition zoned exposed shows presence of pro-thylakoid membranes instead of prolamellar bodies which are generally formed in the dark grown plants. As proposed by Roy et al. Phy A might be playing role in manifestation of this inhibition of greening process in these seedlings grown in photoperiods. Results from the earlier [13,14] and present study demonstrate that it is not continuous illumination with red light but a threshold of red light (2,16,00,000 μmol m-2) which is required for manifestation of present inhibition of greening process. The subsequent dark period does not restore the greening process. Synthesis of PORA and subsequent assembly of Phlide-PORA is also affected as demonstrated by increase in ratio of relative fluorescence of Pchlide to Chlide and by blue shift in the photo-transformable Pchlide forms. Antibody for POR A was obtained from Dr. WT Griffiths. The work was supported by a competitive grant from the Department of Science and Technology, Govt. of India (DST/SP/SO/A-49/95).